Joining him in quitting is co-founder Kevin Carroll who along with Robinson will join think tank The Quilliam Foundation, an organisation that was set up to tackle extremism. Run by Maajid Nawaz, formerly a supporter of hate group Hizb ut-Tahrir the move has been criticised as just a tactical retreat, alongside Robinson commenting that street protests are “no longer productive”. However, he explains that he aims to “counter Islamist ideology…not with violence but with better, democratic ideas”. Robinson’s drastic change in direction follows his 18 week stint in prison for travelling on someone else’s passport. Here, he had time to re-think and evaluate his position as leader of what has undeniably become an increasingly anti-Muslim group. Although Robinson campaigns against Islamic ideals, it is not Muslims as individuals that he wishes to ostracise. “I have a passion to combat Islamist ideology, and I want to lead a revolution against that ideology, but I don’t want to lead a revolution against Muslims” he stated. 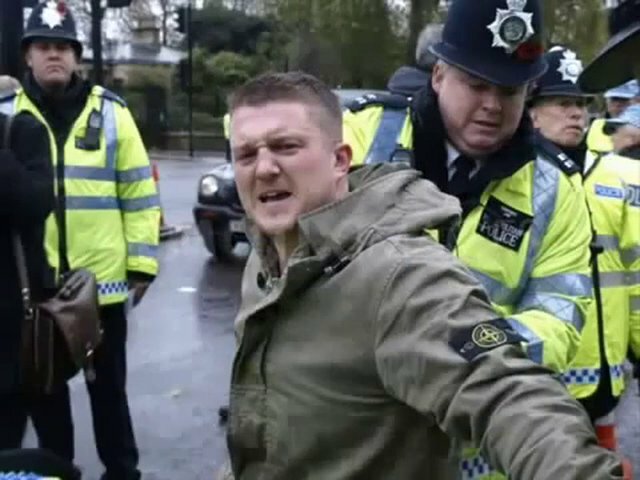 Robinson’s claims are particularly potent when considering the controversial image sported by an EDL supporter at a rally in Birmingham in June this year. The bolshie young man lifted up his top to the cameras to show a tattoo of a picture of a mosque with the word ‘Boom’ emblazoned across it. It is this type of extremist behaviour that Robinson outlined as a key part of his decision to leave the group. Nonetheless critics of Robinson and Carroll remain sceptical of whether they have truly renounced their ways. Only earlier this month, Robinson Tweeted a picture of a Muslim man holding a pint of beer while making a rude gesture, coupled with the caption ‘this is the best Muslim I know’. The picture will offend many Muslims due to their strict rules on drinking and sparks doubt against Robinson’s claims that he is not anti- Muslim.